Courtney Leigh Johnson has ticked off routes in some of the country's most notorious climbing destinations, from Bishop to Hueco Tanks. But she calls Rumbling Bald, the boulder-strewn forest in Hickory Nut Gorge State Park, her "favorite place on the planet." After growing up in New England and living as far away as Homer, Alaska, she and her husband, Gabe, have made their home in West Asheville. 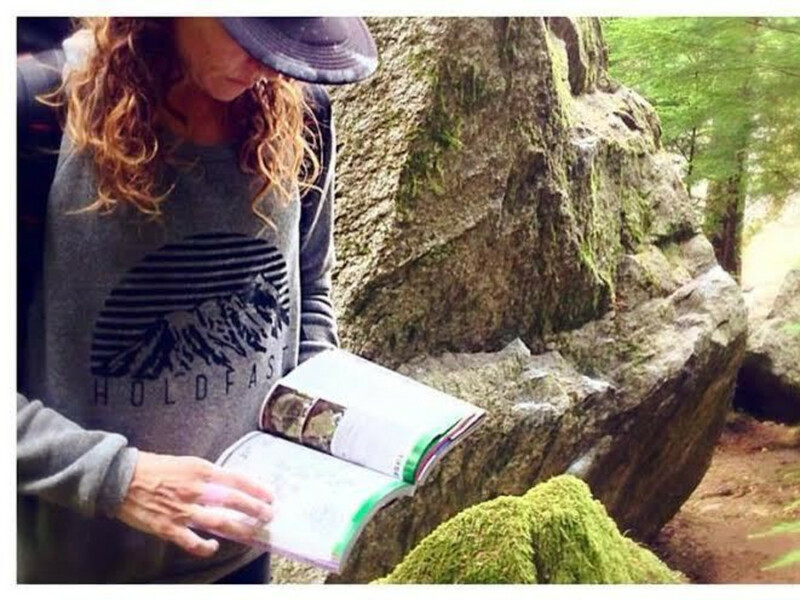 She is the creator of Holdfast Outfitters, a purveyor of handprinted outdoor clothing and accessories. We sat down with Johnson to chat about the business and the mountain town that has inspired many of her most popular designs. 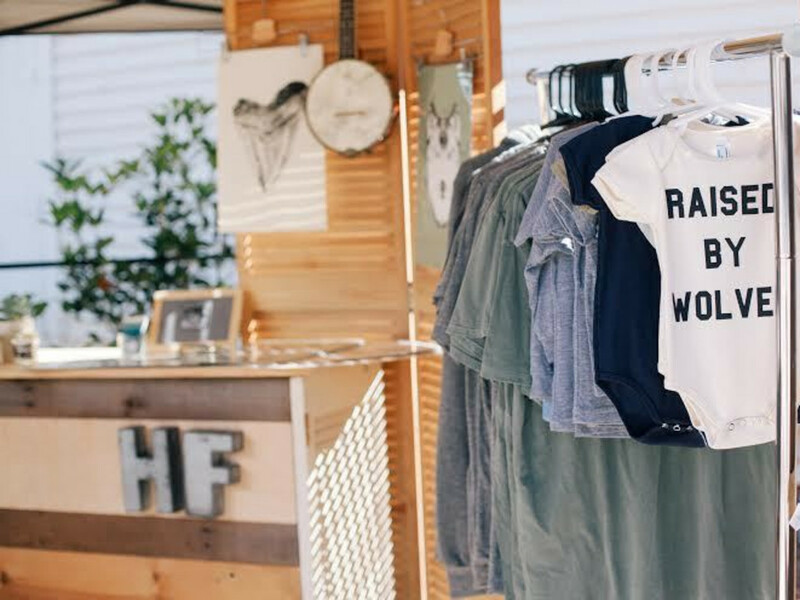 Hand printed clothes and goods by Holdfast Outfitters on display at an Asheville pop-up shop. 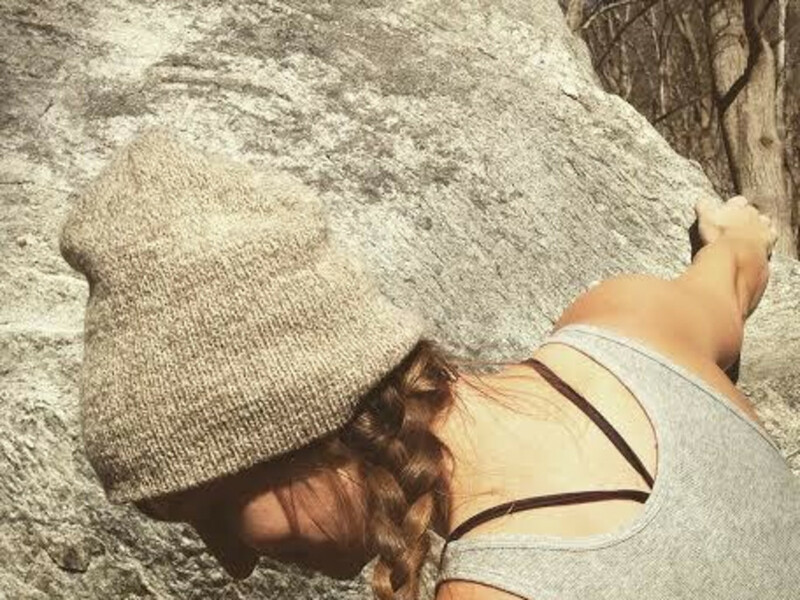 Timber Hitch Co.
Tell me a little about the concept behind your brand. Holdfast Outfitters is a lifestyle brand with a summer campy vibe. We have simple designs that speak to the hip, outdoorsy person—someone who doesn't just want to wear technical gear all the time. The clothes are printed by hand on a one-armed wooden press that Gabe made for me. I hand pull everything: It's old school. Is living in Asheville conducive to owning a small business? Asheville has cred! It's actually really funny—we do shops all over, and whenever you say you're from Asheville, you instantly have credentials. Everyone always says they wish they could live there. As a city, it's really supportive of small local businesses. People are eager to come out to craft shows and pop-up shops. They're also really willing to pay more for something that is handmade. Holdfast started as a screen printing studio. I was working at a plant nursery and printing T-shirts on the side to sell on Etsy. I never thought that it could be a full-time thing. On a whim I applied to the The Big Crafty—and got in! We had one design: North Carolina with a heart over Asheville, and it said 'Home Sweet Home.' It was inspired by how much I love Asheville, and it spoke to a lot of people; we sold out. We did so well that I realized I could make this my full-time job. Where does the name Holdfast come from? A 'holdfast' is the part of the kelp plant that anchors it into rocks and soil. It's also an old-fashioned nautical term for anchor. I felt it was symbolic of how I felt toward Asheville—I wanted to be anchored there and make it my home. It also touches on climbing, you know? You just have to hold on and not let go. You grew up in Connecticut and began climbing in California. How did you end up in Asheville? I moved back to the East Coast to be closer to my parents when my mom got sick. I ended up in Hendersonville (North Carolina), working for the Mountain Trail Outdoor School. On the weekends I'd visit friends in Asheville, and I started climbing at Rumbling Bald. I felt a sense of place here, like I belonged. Asheville and Hendersonville, they've just always felt like home. And Rumbling Bald—I think it's my favorite place on the planet. What do you love about bouldering in Rumbling Bald? I met Gabe at Rumbling Bald! I've spent time there with all of my closest friends. When I think of Western North Carolina, I think of that drive on 74A. It's so huge! It’s expansive; I’ve been climbing there for almost 10 years and we still somehow find problems we never knew existed. We still get lost there, which is crazy; I’ve been there so many times. It’s such a friendly place. Climbing in the South in general is just way friendly. Describe your ideal Asheville Day. I stop at Battlecat Coffee Bar for an iced latte and a hummus bagel. I head to Rumbling Bald for the day, then sit in my friend's wood-fired hot tub in Gerton. I drive back on 74A and grab a snack at Hickory Nut Gap Farm for hummus and pepperoni, perfect climbing snacks. In the evening we grab a sour beer at Wicked Weed, which is started by climbing friends! In fact, Walt, the owner, took me up The Nose on Looking Glass Rock, one of my first multi pitches. How do you keep active in the winter? Besides Rumbling Bald? (Laughs.) I like bouldering at Stone Fort/Little Rock City. We go hiking with the dogs; my favorite is Pilot Cove Loop. I also like Panther Town. Gabe kayaks there and it's a big native plant destination. They call it The Yosemite of the East. 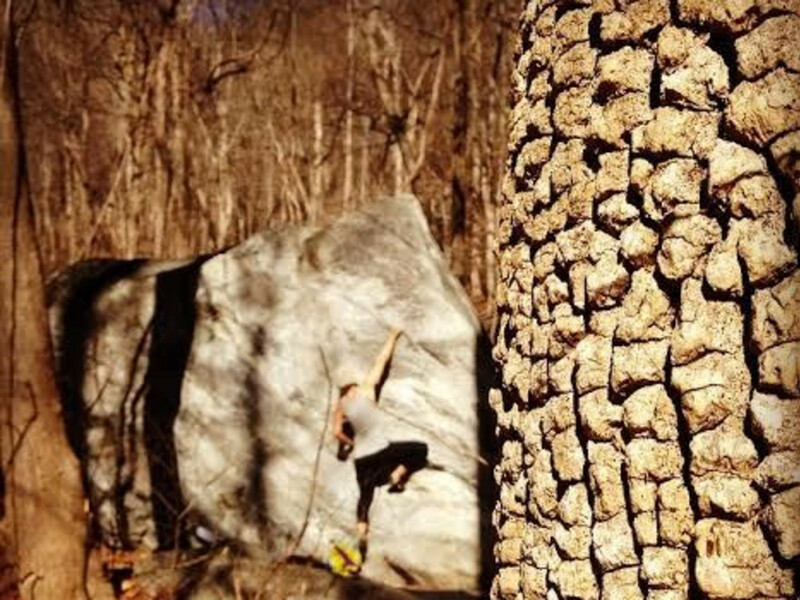 There's Chattanooga, Knoxville, sport climbing at the Red and the Obed. I mean, this is why a lot of people live in Asheville. It’s such a central location for a lot of really great outdoor destinations.